Now that you’ve decided on a loft conversion for your home, it’s time to find a reputable loft conversion company. Considering the financial investment and health and safety aspects at stake, it’s essential that you choose a company that will do a great job – and of course you want to avoid the cowboys at all costs! 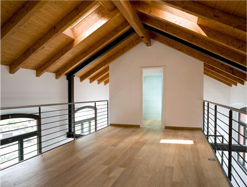 So take a look at our tips for finding the right local loft conversion company. Look for a physical address and contact number. It might seem like a simple thing, but loft conversion companies that provide contact details can be tracked down in the event of anything going wrong. If a contractor is unwilling or reluctant to provide contact details, avoid them. Check out reviews and past projects. Reviews are one of the truest and most reliable forms of recommendation (or criticism) available, and thanks to the internet they’re pretty easy to find. Having said that, a loft conversion company that does a good job and is proud of the work they do will have reviews on their website, so take a look at these too. And don’t forget about good old word of mouth, the most powerful review there is! Companies that outsource work to external contractors can’t guarantee the standard of work that will be completed. Having set employees that are professional and qualified provides you with a peace of mind that work consistency and quality is high – and you don’t want to settle for anything less when it comes to your home. See what the loft conversion company can do for you. It’s important to remember that the company is working for you, not the other way around. So make sure that your chosen company can meet your specific requirements; many companies provide a free planning service so take advantage of this where you can to get a better idea of their skills and expertise. Interloft is a Yorkshire loft conversion company that has over 15 years’ experience in the industry and we pride ourselves on the high standard of work we provide. We complete each project in 6-8 weeks whatever your requirements, be it a dormer, part loft or complete attic conversion. We take care of the planning permission (if applicable) for you and provide building regulation certificates so you can rest assured your loft conversion is completely compliant with legal requirements. So why not give us a call on 0800 999 4034 today for a no obligation chat and see what we can do for you?